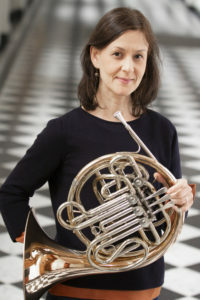 Born in 1977 in Alsace (F), Eliz received her musical training at the Strasbourg Conservatory(F) where she obtained 1st prizes for Horn(class of Prof. Kevin Cleary) and chamber music. After her studies in Strasbourg she went on to study with Prof. Bruno Schneider at the Musikhochschule in Freiburg(D). Since 2002 Eliz is Principal Horn in the Antwerp Symphony Orchestra and she holds the same position since 2011 in the Orchestre des Champs-Elysées. She is a regular guest in orchestras and ensembles such as L’Orchestre Philharmonique de Radio France, Tonhalle Orchestra Zürich, Concertgebouworkest Amsterdam, Rotterdam Philharmonic, I Solisti del Vento. In 2004 she won the 3rd Prize at the International Geneva Competition. She is Horn Professor at the Conservatoire Royal de Mons(B), the LUCA Institute in Leuven(B) and she regularly gives Masterclasses (I Solisti del Vento, Summercourse for Winds). Numerous CD recordings include the Glière Concerto(with the Antwerp Symphony Orchestra, cond. M.Soustrot), works for Horn by R.Groslot, the Ottone Brass Quintet, the Focus Wind Quintet and many others.